Pays applicable membership dues (membership is currently free). 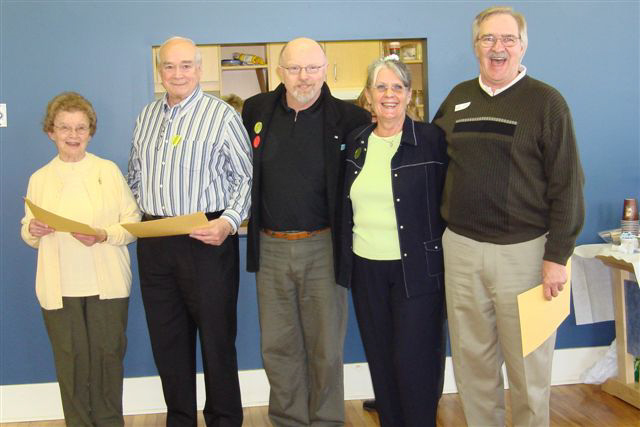 Left to right: Rita Marcoux, Honorary Member, Jean-Guy Lasnier Honorary member, Marcel Piuze, Past President, Lorna Lamothe, Past President, Paul Dodier, Honorary Member) taken at the 25th anniversary celebration. (a) Individual : Any person prepared to further the Corporation’s aims and objectives by word or deed is eligible for individual membership. (b) Corporate : Organizations – public, para-public or not-for-profit, including bona-fide groups recognized by the board. Corporate members appoint one voting representative. (c) Honorary : Each year, the Board may nominate honourary members who have helped the Corporation achieve its objectives through work, deed or financial donations. Honorary members participate in the Corporation’s activities, are invited to annual and special general meetings, but may not vote or become directors. (d) Youth : Any youth (ages 12-17) is eligible for youth membership. Youths who have reached the age of 16 are entitled to vote at annual and special general meetings. Those younger than 16 are recognized as non-voting members. (e) Employees: Employees of the Corporation are members but are not entitled to vote. Why might you choose to become a member? To contribute to the orientation of the organization and elect directors. Why do we want you as a member? To have your input in the organization’s decision-making process.